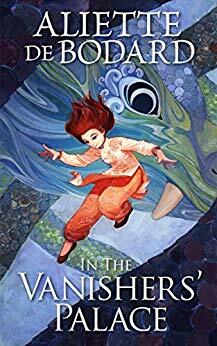 IN THE VANISHER’S PALACE resonates with the story of Beauty and the Beast without being anything as literal as a retelling of it. A post-apocalyptic Vietnamese setting seamlessly blends myth and science is a way vaguely reminiscent of Anne McAffrey but with a completely different cultural context and aesthetic. The basic story is about Yên, a poor scholar abducted by a beguiling but dangerous dragon to be a teacher for her strange children. The story, romance, and revealing of what is happening in the wider world around them occurs at a perfect pace and arrives at a satisfying conclusion. I found the writing style just a little disjointed in the first few pages but eventually got into the flow of it. If I have any complaint it might be that nested into the richness of the world, culture, and relationships sometimes the actual personality of the two female protagonists did not seem quite as multi-dimensional in terms of what the basis was for their attraction to each other and some of their more extreme actions and reactions. But perhaps I am just not appreciating some of the story’s subtleties. The tone of the book is somewhere between science fantasy, romance, and literary but the beautifully illustrated cover gives a good introduction to what is within.